This figure was originally housed at the Wellington centre from the time it opened, but was removed when the centre was remodelled. Many local people objected, as the Drummer had become a popular figure, and it was briefly returned to the Wellington Centre in a new case dedicated “In memory of J.E.C White JP (Mr AIdershot) 12/9/1936 -18/1/2011”. However, it was once again taken out of the Centre and put into store, until moved to the Aldershot Military Museum in October 2018. 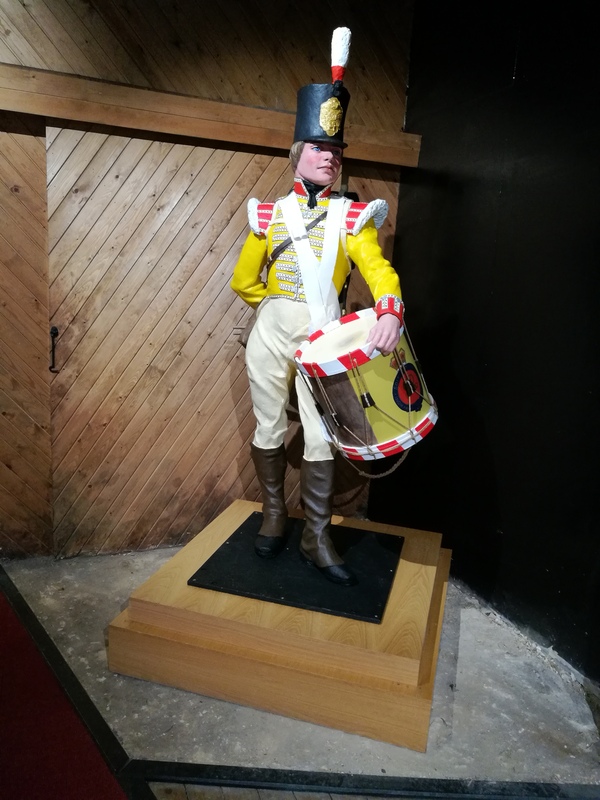 The figure is dressed as a drummer from the 37th North Hampshire Regiment of Foot, as they served during the Napoleonic Wars. The North Hampshire Regiment was recruited throughout the area, including Aldershot and Farnborough, and was posted to the West Indies (1800 - 1809} and Gibraltar (1812 - 1814). In 1814 they had a small part in the Peninsular War when they took part in the investment of Bayonne (February 1814), before being sent to North America. In infantry regiments the drummer was very important, as the drum was the chief means of delivering instructions on the battlefield. The drummers had to march with the battalion on campaign and in the field, enduring the same privations as the line soldiers, and in battle they were with their battalion in the thick of the action and exposed to the same risks, while also keeping sufficiently calm to be able to still beat out the drum patterns which passed on the officers’ instructions to the men. The idea that these drummers were young boys is a myth. Although many were recruited young, on campaign and in battle they were the same average age as the soldiers in the ranks. A reflection of their status was the special uniforms worn by drummers. In many regiments (though not all), drummers wore “reversed colours”, so instead of a red coat with regimental coloured facings as worn by the rank and file, they had coats of the regimental colours faced with red. In addition, they wore “wings” on their shoulders, and lacing on their sleeves. The drummers of the Guards and line regiments, and the buglers that had existed in line regiments from their origin, had always been serving soldiers ... These were certainly not the beardless lads of popular fiction and sentimental imagery, not least because a drummer needed to carry a regulation side-drum and look after himself in the field. Lady Butler’s “Steady the Drums and Fifes” shows the Corps of Drums of the 57th Foot drawn up under fire at Albuhera. It is full of youngsters: one little chap, boldly standing bareheaded to await whatever fate has in store, cannot be more than 10. In fact, the average age of drummers of the 57th in 1811 was a respectable 26. Youngsters, frequently the sons of serving soldiers, were indeed recruited as drummers, often between the ages of 10 and 12, but generally this was little more than a device for getting them pay and rations, though Samuel Potter, in his 1810 “The art of beating the drum”, maintained that it was “of the utmost importance” that drummers were taught during boyhood “whilst the muscles of the wrist are supple”. One survey of the 304 British drummers in units engaged at Quatre Bras and Waterloo, suggests that only 10 per cent of them were between 16 and 17, with the average age of around 25, the same for soldiers in the ranks. The oldest drummer was John Leeds of the 23rd Foot, who had enlisted in 1802 aged 49, and was 62 at Waterloo. Drummers were not necessarily boys. At Waterloo the average age of the drummers in the 2/73 was twenty-three, with the youngest being nineteen and the oldest twenty-seven. They had an average of eight years service each. Often recruited young, they tended to continue their drumming duties well into manhood and were frequently more experienced than the men they served. There was one drummer on the establishment of every company but a number of battalions had more: the 2/30, for example, had fourteen at Waterloo. Their duties included wielding the lash on soldiers sentenced to be flogged. They were supposed to carry a cat o’ nine tails in their pack so that the punishment could be carried out on the march is necessary. With heavy sentences several drummers would be involved, taking turns to give twenty-five lashes each. You can make a donation by clicking the Donate button below which will take you to PayPal. You don’t need to have a PayPal account to do this as all major credit and debit cards are also accepted. You can now pay for your membership via PayPal. See the Join us page for more details. Thank you.